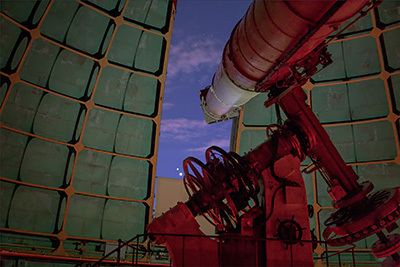 The “Music of the Spheres” concert series gives the public a rare glimpse of the observatory at night, and all proceeds from the event benefit Lick Observatory. Due to program popularity, another concert was added to the lineup this year. Each event features a musical performance, an astronomy lecture by a scientist, and a history presentation about Lick Observatory’s rich past. Afterward, guests take turns viewing celestial objects through the 36-inch Great Lick Refractor and the 40-inch Nickel Reflector. Guests have additional opportunities to stargaze with small ground telescopes provided by amateur astronomers. The “Music of the Spheres” concerts take place June 11 (White Album Ensemble; speaker Natalie Batalha, NASA Ames), June 25 (Dave Rocha Jazz Trio; speaker Aaron Barth, UC Irvine), July 9 (Chaskinakuy; speaker Martin Gaskell, UCSC), July 30 (Black Cedar Trio; speaker Brad Holden, UC Observatories), August 13 (Great Guitars! Daniel Roest and Richard Gilewitz; speaker Shelley Wright, UC San Diego) and August 27 (Golden Bough; speaker Michael Gregg, UC Davis). General, preferred, and VIP tickets will be available. For additional details and ticket information, visit ucolick.org/summer. The “Evenings with the Stars” program also gives the public a chance to view through the 36-inch Great Lick Refractor and the 40-inch Nickel Reflector. Similar to the “Music of the Spheres” events, each program features an astronomy lecture by a “star” scientist and a history presentation. Amateur astronomers also set up ground telescopes so that guests can get additional telescope time. Dates for the Summer Visitors Program are June 10 (speaker Mark Ammons, Lawrence Livermore National Lab), June 24 (speaker Tesla Jeltema, UCSC), July 8 (speaker Raja Guthathakurta, UCSC), July 29 (speaker Connie Rockosi, UC Observatories), August 12 (speaker Quinn Konopacky, UCSD), August 26 (speaker Andreas Burkert, University of Munich). Tickets for both “Music of the Spheres” and “Evenings with the Stars” will go on sale to the general public at noon on Friday, April 15, at ucsctickets.com. Members of Friends of Lick Observatory (FoLO) can purchase tickets starting at noon on Friday, April 8. Lick Observatory is located on the summit of Mt. Hamilton in the Diablo Range east of San Jose. Driving time from San Jose is about one hour via Mt. Hamilton Road (Route 130). Founded in 1888, Lick Observatory is at the forefront of astronomical research as an active research facility. It is operated by the UC Observatories (UCO), a multicampus research unit headquartered at UC Santa Cruz that serves eight UC campuses. Additional information is available at ucolick.org/summer. Please note: Weather may restrict telescope viewings, but other activities will still take place. Due to historic construction of the telescope domes, the 36-inch Refractor and the 40-inch Nickel Telescope are not wheelchair accessible at this time. Children must be at least 8 years of age for admission. Due to late hours the program may be difficult for children under 12.